Sri Krishnadevaraya University, Anantapuramu has released notification for eligible candidates to take admission into Two years B.Ed. Programme under Distance Mode. Sri Krishnadevaraya University, Anantapuramu helds admission into various UG and PG courses. 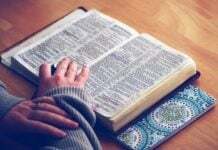 Eligible candidates may apply online for B.Ed. Programme under Distance Mode before the last date. 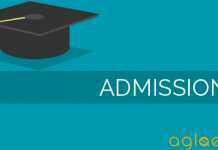 Candidates can check the complete details of SK University Distance Education Admission 2019 application process, eligibility criteria and other information on this page below. Latest: The details of the admissions made for the academic session 2018-19 (January 2019) under open and distance learning has been released. Scroll down to check the same. Candidates can apply online to admission in UG and PG Courses at SK University from the official website www.skucde.com as per schedule. Eligible candidates will be given the admission after scrutinizing the original certificates, Payment details pertaining to the Course fee Upload Online. Schedule for the SK University Distance Education Admission 2019 is given below. the details of the admissions made for the Academic Session 2018-19 (January 2019) Under Open and Distance Learning.Sri Krishnadevaraya University, Anantapuramu has release the Result for admission in various UG and PG courses for this session. Candidates can check the result by entering their Hall ticket Number. The direct link to check the result is also provided below for the sake of candidates. Result: Click here to check the details of the admissions made for the Academic Session 2018-19 (January 2019) Under Open and Distance Learning. Candidates can fill their application for B.Ed course from the official website as per scheduled date. The candidates are advised to go through the Instructions carefully before filling the ICR application form and mention clearly the course, medium i.e., Telugu/English medium and the combination of subjects for which they wish to apply. Candidates can also apply online from the link provided below. Application process is now over!! After filling of the online application, candidates are directed to send the Printout of the filled in application along with the demand draft of Andhra Bank/State Bank of India for Rs. 500/- drawn in favour of the Director, Directorate of Distance Education, S. K. University, Ananthapuramu payable only at S. K. University Branch, Ananthapuram towards Application Registration fee on or before 31-01-2019. The candidates should write his/her name, address, course and the purpose for which the payment was made on the reverse side of the Demand Draft. Postal orders, Money orders, Mail transfers, Challans, and Cash payment will not be accepted. The candidates are required to submit the following Xerox copies of the certificates along with the filled in online application. NCTE recognized teacher education programme through face-to-face mode i.e TTC/D.Ed./D.El.Ed./B.P.Ed./DPSE/Fine Arts etc. Service certificate issued by MEO/DEO/ Commissioner/Concern authority as per Annexure-1. No Objection certificate by DEO/ Commissioner/Concern authority as per Annexure-1. Filled in online application form along with the above enclosures should be sent to the following address on or before Feb 04, 2019. 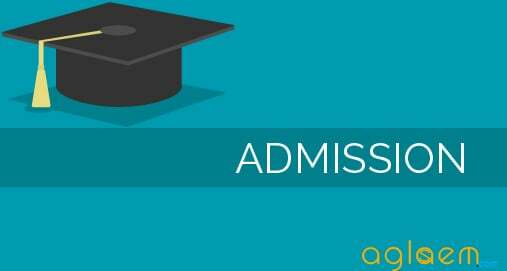 Application for Admission into B.Ed. course. Ananthapuramu (A.P) – 515 003. Candidates who have passed the Two year I.T.I. or Two year vocational course after S.S.C. Candidates who have passed the eligibility test conducted by DDE, S.K.University between 2011 – 2014 are eligible for direct admission, subject to the condition that the candidates must have completed 18 years of age as on 01.07.2015. Eligibility Test Stream: For those who do not have any formal education or who have not passed the Intermediate or its equivalent and should have completed 18 years of age as on 01-07-2015. Direct Admission: Candidates who have passed the Intermediate and A.P Open Intermediate or its equivalent examination with relevant subjects as electives. A candidate with a pass in 10th Class or equivalent and pass in two years of ITI/Polytechnic/two year‟s vocational course/equivalent course is eligible to apply to B.Sc., Course. Pass in Science entrance examination conducted by DDE. Trained in-service teachers with a Bachelors Degree working in Government Recognized Schools or working in Educational Sector as primary, upper-primary teachers with SGT/PRT/TTC/D.Ed.,/D.El.Ed./D.P.Ed./B.P.Ed./Fine Arts course or any other NCTE recognized Teacher Education Programme through face-to-face mode. The candidates must fulfill eligibility as per NCTE, 2014 Regulations. The service of candidates must have been approved by the authorities of school education concerned DEO/MEO/ Gazetted Headmaster. And all the eligible candidates have to submit the copies of their updated Service Registers duly authenticated by the appropriate authorities along with the Application. Candidates must bring their original Service Registers and No Objection Certificates at the time of admission. Those who do not have Service Registers shall bring Service Certificates and No Objection Certificates from the concerned authorities. Physical Science Candidates with B.Sc. who have studied Physics and Chemistry of allied material sciences under Part-II group subjects or B.C.A. 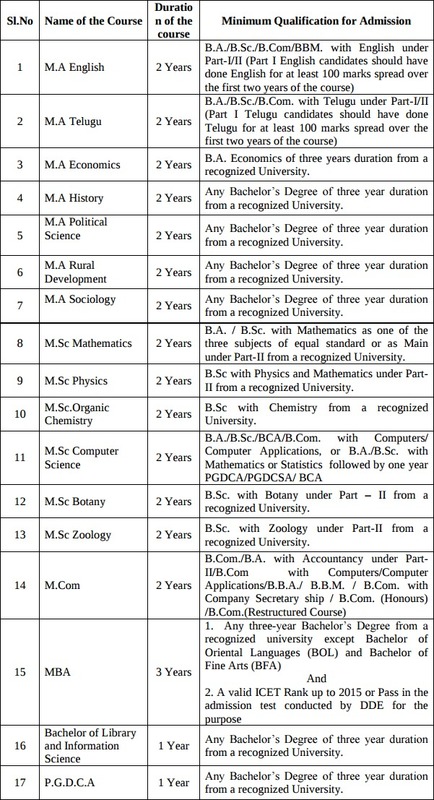 candidates with Physical Sciences (Physics and Chemistry) at Intermediate level as group subject. Biological Science Candidates with B.Sc./B.Sc. (Home Science) who have studied Botany and Zoology or allied Life Sciences under Part-II group subjects or B.C.A. candidates with Biological Science at Intermediate level as group subject. Social Studies All candidates with B.A/B.Com./ B.B.M. or B.C.A. candidates with Social Sciences at Intermediate level as group subject. Candidates should submit the following original certificates along with one set of attested xerox copies of the certificates and along with one set of expenditure. If the candidate fails in submitting the required certificates at the time of admissions, the admission will not be extended. Degree Marks memos and Provisional or Original Degree certificate. TTC/D.Ed/D.El.Ed / D.P.Ed. / B./P.Ed. or any other course NCTE recognized teacher education program through face-to-face mode. Service Certificate issued by MEO/DEO/Commissioner or Concern Authority. B.Ed Counselling 2019 – The SK University will announce the schedule for Counselling for admission to B.Ed courses under Distance Education Admission 2019. The candidates are called as per the Area of candidates (Local / Non – Local). The candidates are directed to attend to counselling for admission as per the schedule is given below. Eligible candidates will be given the admission after scrutinizing the original certificates, Payment details pertaining to the Course fee Upload Online. Admission is open to all those who have the prescribed qualifications. Candidates selected for admission will receive the admission intimation through respective Study Centres. The candidates who have applied under eligibility test stream have to take the Eligibility Test on obtaining the Hall-Tickets. The qualified candidates have to pay the prescribed Course fee Online within the stipulated time. Candidates selected for admission will receive the admission intimation through respect Study Centres. Note 1: The application will be summarily rejected if there is any discrepancy between the information in the application and the supporting documents. Admission cannot be claimed as a matter of right. Note 2: When the candidate is declared eligible for admission, the fee will not be refunded under any circumstances. Eligible candidates will be given admission after scrutiny of the original certificates, Bank Receipt pertaining to the Course fee etc., enclosed to the application. Admission is open to all those who have the prescribed qualifications. Candidates selected for admission will receive the admission intimation cards by post. Director of DDE reserves right to cancel the admission of an ineligible candidate at any stage of the course. Note 1: The application will be summarily rejected if there is any discrepancy in between the information in the application and the supporting documents. Note 2: Once a candidate is declared eligible for admission, the fee will not be refunded under any circumstances. Note 3: Admission cannot be claimed as a matter of right. If adequate number of candidates is not enrolled for any particular course, the University reserves the right to discontinue the course. In such a case, the course fee and other certificates will be returned. Admission will be done on the basis of length of service as on Dec 31, 2018. Reservation of seats will be followed in accordance with the G.O.s of Govt. of Andhra Pradesh with regard to various categories and reservation of women. 85% of the seats in each methodology shall be reserved for the Local candidates and 15% of the seats shall be left unreserved as specified in the Andhra Pradesh Educational Institution (Regulation of Admission) Order 1974 as amended in G.O P.No.646 Education (W) Dept. dated 10-7-1979. The part of the State comprising the district of Ananthapuramu, Kurnool, Chittoor, Kadapa, and Nellore shall be regarded as S.K. University local area. The service certificates of the Teachers should be countersigned by the District Educational Officer/Mandal Educational Officer/Principal concerned. Service Certificates will be further sent to the concerned authorities for verification and authenticity and only after getting confirmation from the concerned authorities, the candidates will be admitted. Candidates will be required to submit filled in application form along with Photostat copies of the documents. The original documents are to be submitted after receiving the letter of offer for admission into B.Ed, from the DDE, S.K. University, Ananthapuramu. If your service particulars are found to be false, at any stage, the admission stands cancelled without refund of the Application and course fee. For more details of SKU Distance Education Admission 2019 candidates can download the Information Brochure for UG, PG previous year and B.Ed course 2019 from the link provided below. Insofar, Official details for SK University Distance Education 2019 for UG, PG has not been announced yet, only the information related to B.Ed has been released. Information on this page is based on last year information brochure and for reference purpose only. As soon as Sri Krishnadevaraya University, Anantapuramu will release the information it will be updated here. we have not got Mcom 2nd year results which we wrote in jan2016…….. still waiting.